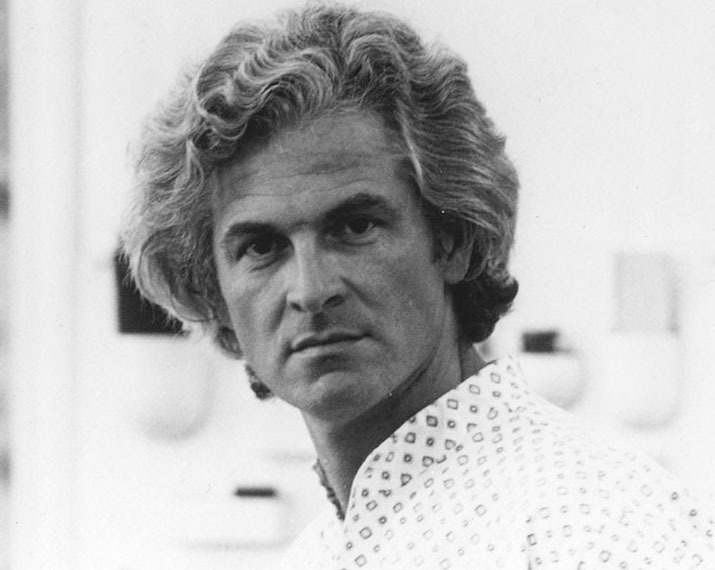 Pierre Paulin in the late 1960s (image credit Stardust.com). Anatomy of a classic: Pierre Paulin's Ribbon Chair. Pierre Paulin created the iconic Ribbon Chair in 1966 for the Dutch furniture firm Artifort. Pierre Paulin originally trained as a sculptor at the Ecole Camondo in Paris. As the (forgotten) story goes, while attending school, Pierre Paulin ended up in a fight with another student over a girl. Pierre Paulin was stabbed in his hand which left one of his hands impaired. 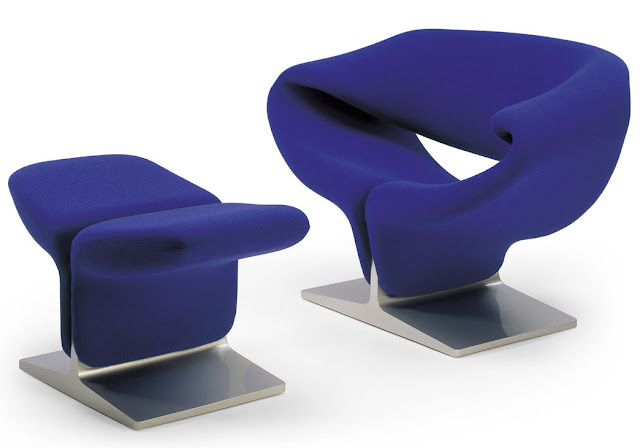 Being unable to sculpt any longer, Pierre Paulin turned to interior- and furniture design. This explains why most of the creations by Pierre Paulin appear like sculptures. 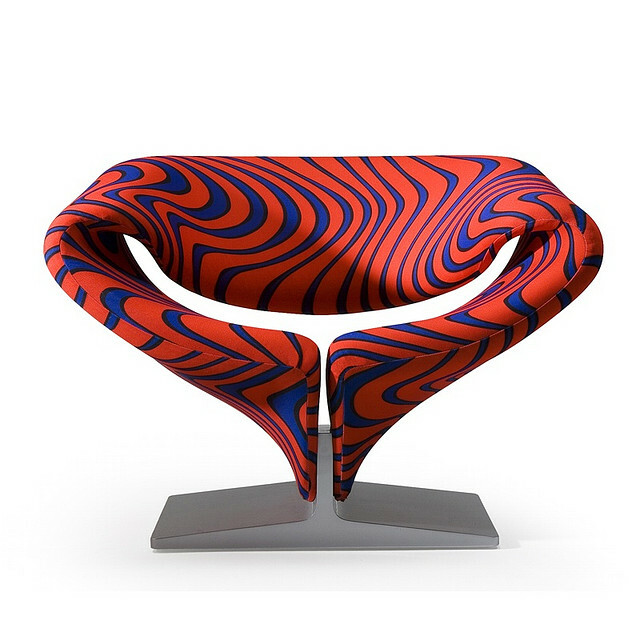 Space Age Take Off: Ribbon Chair (image credit Stardust.com). 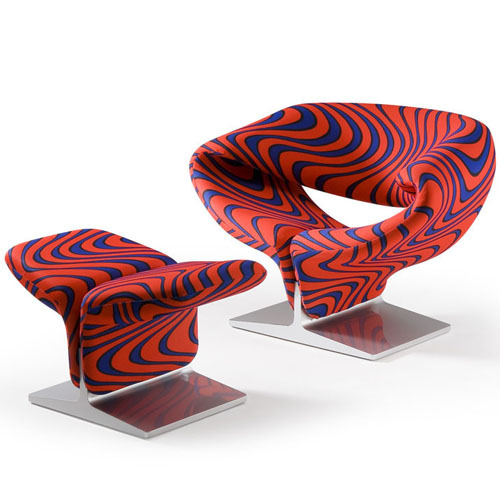 Artifort Pierre Paulin Ribbon Chair 1966 with Jack Lenor Larsen Momentum Blue Flame Upholstery (image credit Stardust.com). Admired and exhibited all over the world, Pierre Paulin was an architect of the imaginary, an unwitting creator of fashion, an unpredictable and pioneering spirit. 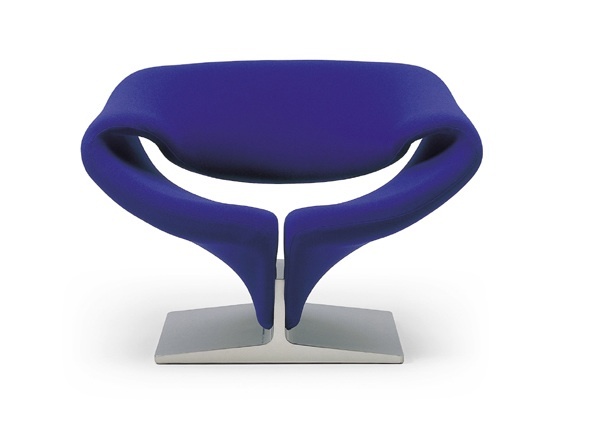 One of his icons of modern design is the Space Age sculptural Ribbon Chair. Pierre Paulin's Ribbon Chair is one of the few chairs that, from the 1960s to the present day, has never ceased to be modern. Art and comfort is what this world-famous brand stands for. And for timeless design. Design that endures. Design that is authoritative. From Pierre Paulin and Geoffrey Harcourt to René Holten and Patrick Norguet. Design for sitting, waiting, meeting, storing and discussing. It's no accident that our delightful, exclusive furniture features in the collections of the Museum of Modern Art and the Centre Pompidou. 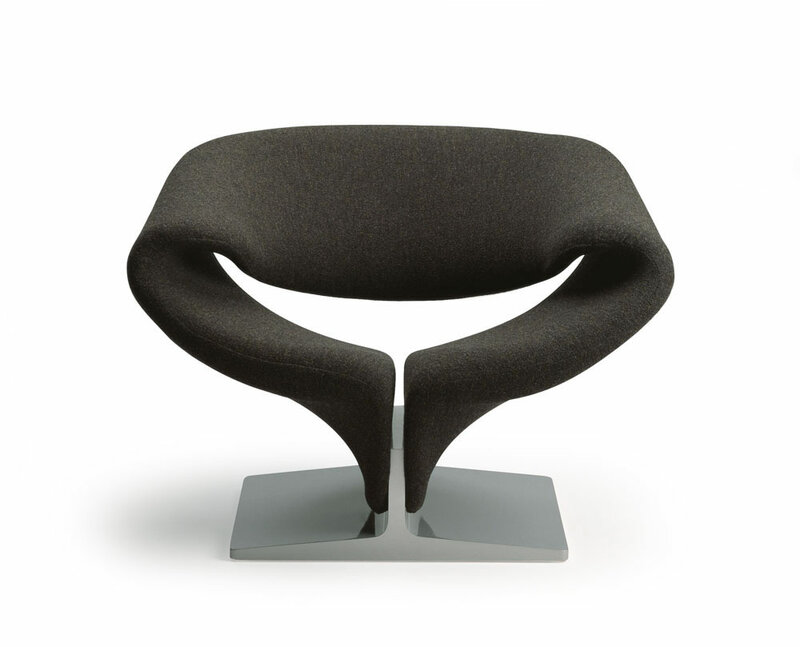 Artifort means top-quality design by top designers. For the home, office, boardroom or lobby. In the Artifort collection, everyone who attaches importance to form and function will find a design that captures their heart. Pierre Paulin Ribbon Chair with De Ploeg upholstery in Light Beige Freeze 00-22. 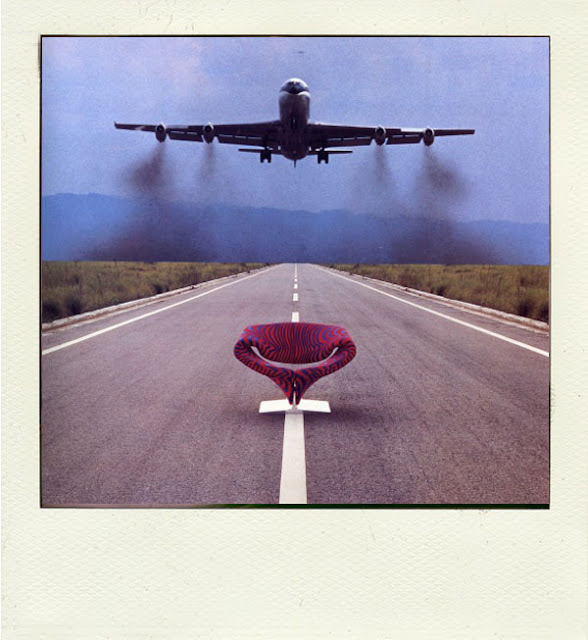 Pierre Paulin Ribbon Chair with De Ploeg upholstery in Freeze 84-22. Artifort's breakthrough came at the beginning of the nineteen-thirties when the company started to use Epeda interior springing. Up until then, straw, horsehair and kapok has been used as filling materials, sometimes in combination with iron springing. Upholstering furniture with these materials was extremely labour-intensive. Epeda interior springing offered an attractive alternative and Artifort managed to acquire a licence to the Epeda patent. What was special about this interior springing, which was already being used in mattresses and car seats, was that it was woven from a single steel wire. Epeda interior springing combines a high level of comfort with great durability. Moreover, using this interior springing provided a major saving in production time. Pierre Paulin Ribbon Chair with De Ploeg upholstery in Stavanger 16/32-25. A great deal changed with the arrival of the interior and furniture designer Kho Liang Ie. His forward-looking view, his great knowledge of design and his international contacts were not only determining factors in the successes of the nineteen-sixties and seventies but have continued to exert their influence up to this day. Artifort and Kho Liang Ie introduced talked-about designs and together ensured that the name Artifort became a runaway success internationally, both with architects and lovers of design. In 1959, Kho Liang Ie recruited the French designer Pierre Paulin, who introduced new techniques and constructions. He also designed a new logo for Artifort with Harry Sierman. Pierre Paulin's designs were fresh and innovative. His striking, brightly colored seating sculptures raised eyebrows at home and abroad. 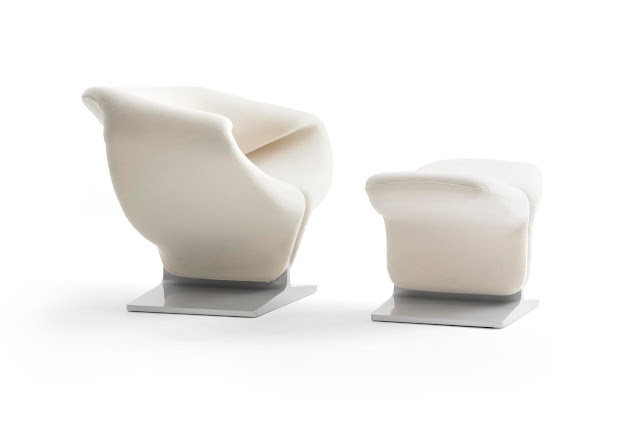 Right up to today, they are regarded as the face of the Artifort collection. To produce these designs, a new construction method was introduced in collaboration with Artifort's development department. Artifort started to work with foam-covered metal tube frames and stretch fabrics. In 1967 Pierre Paulin met Jack Lenor Larsen and together they formed a golden duo. In fact they changed the way in which the world viewed design, in terms of form, materials and textiles. Now, forty years later, Artifort has resumed production of the fabric Momentum exclusively for Pierre Paulin's designs. The Pierre Paulin Ribbon Chair is sold in the US through Stardust. Pierre Paulin Ribbon Chair with De Ploeg upholstery in Toulouse 66/21-16.